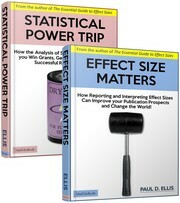 What are the two “families” of effect size? By some counts there are more than 70 effect size indexes. Some of them you will be familiar with (e.g., odds ratio, relative risk). Some double-up as test statistics (e.g., r, R2). And others sound like planets from Star Trek (e.g., the Pillai-Bartlett V). This entry was posted on Monday, May 31st, 2010 at 2:12 am and is filed under effect size. You can follow any responses to this entry through the RSS 2.0 feed. Both comments and pings are currently closed.